← Subcultures: Inside the World of Woodworkers! We were in Charleston, SC last week and came upon this while walking through the streets among to the old house on the water front. Needless to say, were we’re quit puzzled about what it was and why you would need rockers on the end. A legend of the Kinloch and Huger families (pronounced kin-law and u-gee), states that the first joggling board was built at Acton Plantation in Sumter County near Stateburg, South Carolina. The plantation was built in 1803 by Cleland Kinloch of Weehaw Plantation near Georgetown, South Carolina. When Mr. Kinloch became widowed, his sister, Mrs. Benjamin Kinloch Huger, came to Acton to care for the household. Mrs. Huger suffered severely from rheumatism, and one day wrote her relatives at Gilmerton, the family estate in Scotland, that she had the side of her carriage removed so that her chair might be placed in it and she could go for a ride. This was the most exercise she could manage. In reply, her Scottish cousins sent a model of a joggling board which they suggested she could sit on and bounce gently, this giving her more exercise. The plantation’s carpenter constructed a joggling board from fine local timber following the model sent from Scotland. From this beginning in the early 1800?s, the joggling boards spread quickly to the yards and piazzas of the Lowcountry until it became almost as commonplace as a swing set or hammock is today. After World War II, satisfactory timber for joggling boards became harder to acquire, and the cost of labor made the hand fashioning almost prohibitive. During the Tricentennial of South Carolina in 1970, the Old Charleston Joggling Board Company was formed to return to the American scene this wonderful part of plantation America and the South Carolina Lowcountry. 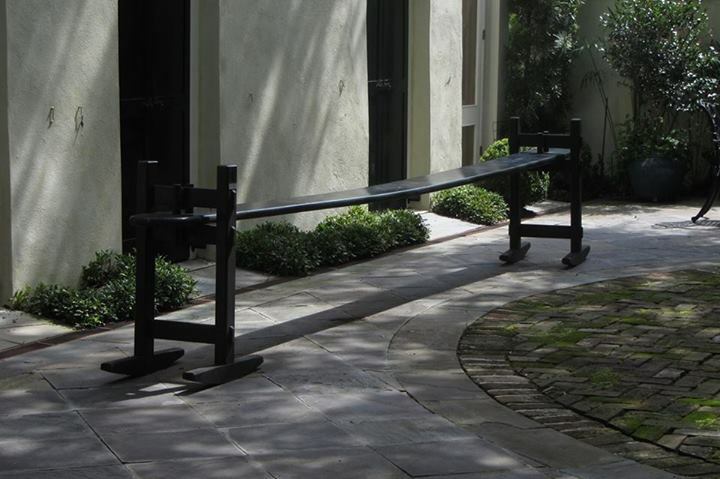 Ever since, we have been producing joggling boards and benches for families all over the U. S. and abroad using the best materials available today. This entry was posted in woodworking and tagged historical. Bookmark the permalink. Very interesting indeed. I wonder what timber they used? I suppose something with very straight grain. just added this to my need to build one someday file. LOL! I don’t know, the bouncy ball seems have done OK. 🙂 I have to admit, joggle certainly is a funny name. Is there a weight limit on the joggling board? Hmmm .. not really sure. I’ve never built one, but that information might be available on the internet.